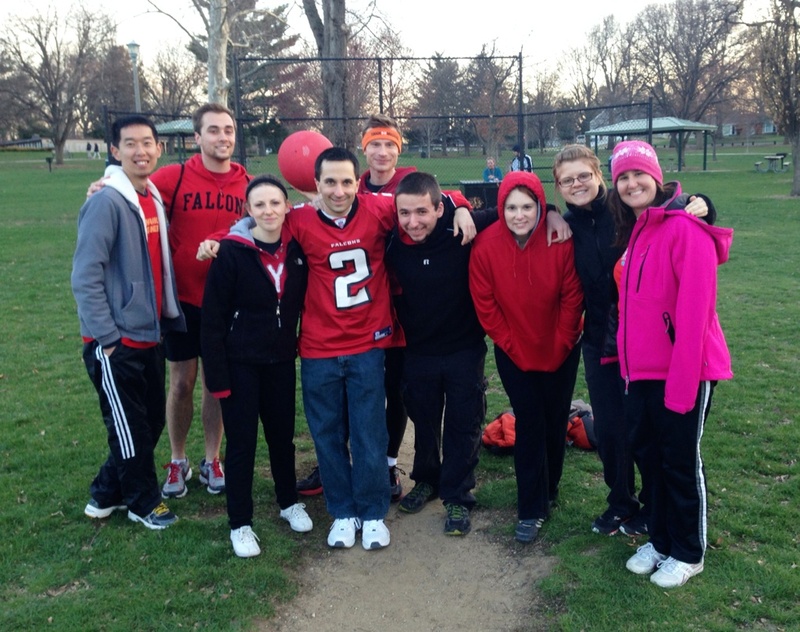 Week in Review: Fab Lab visit, Kickball game, and an Amazing Omelet! This past week was a unique one in ways which were fun. On Palm Sunday I visited the C-U Community Fab Lab, which may perhaps fly under the radar as an innovative place to visit and merge technology and your creative side. 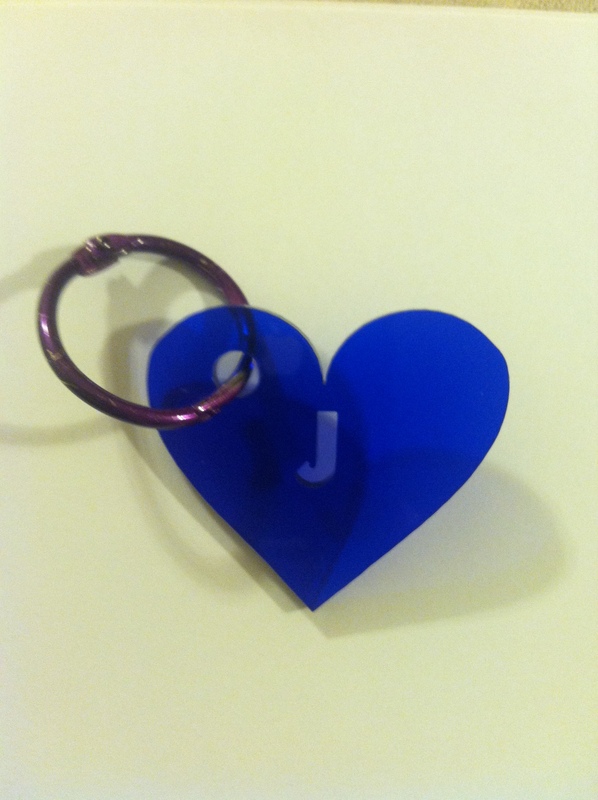 It’s a free community place where you can utilize a laser and an open source computer program to create your own key chain, make a magnet, or do more intensive things such as 3D printing and creation of your own designs. It appeals to various ages, and while the young boy next to me seemed to do slightly better with his project than I did, with the help of three awesome volunteers I was able to solve some issues I was having and emerged victorious with a pretty blue heart key chain with my initial inside that I created. I even got a pretty purple key ring to go with it! See my photo below and the website links (including Flickr group for project ideas) if you are interested in learning more about the Fab Lab +/or visiting. Next was an amazing omelet that I made heavy on the cheese which turned out good. I’m not Betty Crocker or Rachel Ray, but that’s ok. I get excited when I cook something and it turns out well, because my forte is in areas other than cooking. So I was definitely proud of my omelet! Unfortunately, I don’t have a photo to illustrate, because I ate the omelet exceedingly fast and was not thinking of photo-journaling. 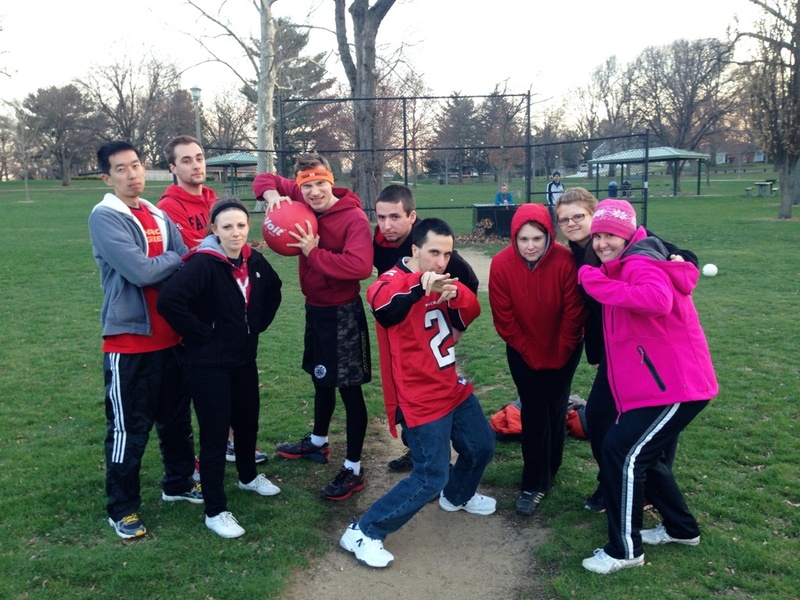 Finally was the fun kickball game that was competitive and took me back to childhood. It was between my small group and another small group from my church (note: our huge small group had actually split several months ago into 2 groups due to our size, but we still regularly get together for social outings). Honestly, I don’t think I have played kickball since grade school, and I found my self asking questions as the game went on, such as “do you have to wait till the ball is kicked before you run from your base?” However, unfortunately, I got out immediately three times when I kicked. My balls always seemed to fly high, and the other team were stars at catching them. My team was great at that, too, but we were vastly outnumbered, and I think that made a difference in our loss. But fun was had by all it seemed, and I was happy that ONE TIME I ACTUALLY GOT ON BASE! I DIDN”T EVEN GET OUT UNTIL RUNNING TO THIRD BASE! I have always appreciated the saying, “it is not whether you win or lose, it is how you play the game.” It was a ton of fun. See photos below to illustrate. 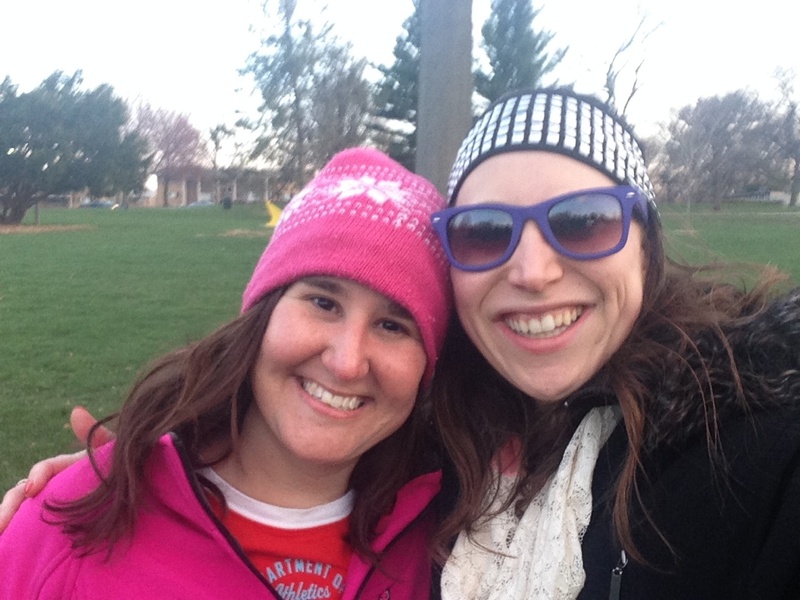 Kate and me (Small group Kickball)! Finally, while there were some not fun issues to the week (re: multiple doctor’s visits & health issues, etcetera), but the week was good overall. Now I’m looking forward to Easter Sunday and my Dad visiting. We’ll get to attend church together and have quality father-daughter time. Sweet! My most popular post on my Pinterest account by far has been an original pin that I posted of a Do It Yourself Snowman project. 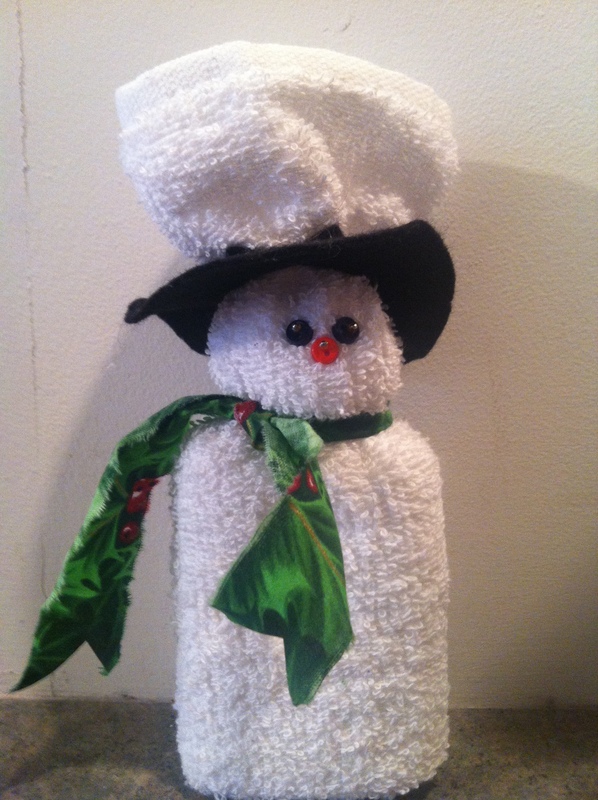 There have been 463 re-pins and 70 likes on Pinterest since I posted the DIY- Snowman pin a year ago. The project is really cute and easy to make. You use a bar of soap as a base and wrap it with a white hand towel. Next, you use black felt for a hat, add a scarf, and add buttons on the snowman’s body (which you can’t see in the picture) and add buttons for his eyes and nose. My co-worker made this Snowman for me last Christmas as a Christmas gift using the idea she saw at a local craft show.